If the sheep hadn’t been chased out of the Sierra, the meadows would not look this this. Recently, there has been a lot of news, from Nevada, about grazing rights on public property. As I read about the conflict I was immediately reminded of the Sierra Nevada, the late 1800s, and sheep. Sheep ranching has a long history in the state of California. In 1880, there were in excess of four million of what John Muir would call “hoofed locusts”, more than in any other state in the union. Many of the original shepherds had come from Spain, where the custom was to use the lowlands in the winter for grazing, and then the high mountain meadows when the weather turned warmer. If such a technique worked in Europe, why not the Sierra? It turned out that there were lots of problems with that approach, mostly stemming from two fundamental conditions: there were too many sheep and there were few controls over who could graze where. (What controls that did exist were unenforceable). This lack of policy meant that whomever got to the meadows first got to do the grazing, which led to herders arriving earlier and earlier in the year. As bad as sheep can be on a meadow in mid-summer, they are a hundred times worse in early spring, before the ground firms up and before the grass has time to fully develop. It quickly became clear that this was not only unsustainable, it would leave scars in the mountains that would last for decades. In 1893 Harrison decided to set apart and reserve part of the Sierra Nevada, and shortly afterwards more than four million acres on the western slopes were declared off-limits to sheep. The herders, at first, paid little attention. Why should they? President Harrison wasn’t around to chase them out. Eventually, the Unites States 5th Calvary was called to police the forest, including Yosemite. (The unit in Yosemite was led by First Lieutenant N. F. McClure, who would name one of the passes out of the park after one of his NCOs: Sergeant Donohue.) Even then it took years for the government to gain the upper hand. At one point, sheep herders went as far as hiring a network of scouts, trained to locate the army and signal their location and direction of movement via signal fires. Eventually the sheep were evicted, although they did return for three years during the latter part of World War I. 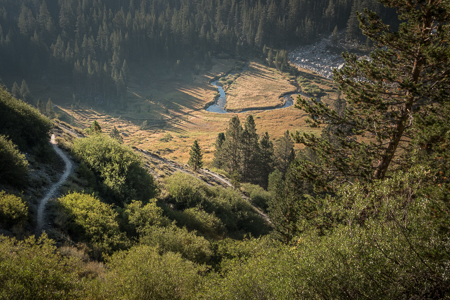 Running cattle on marginal land in the Sierras is still a problem. A terrible use of public lands. Thanks for the comment, Jack.